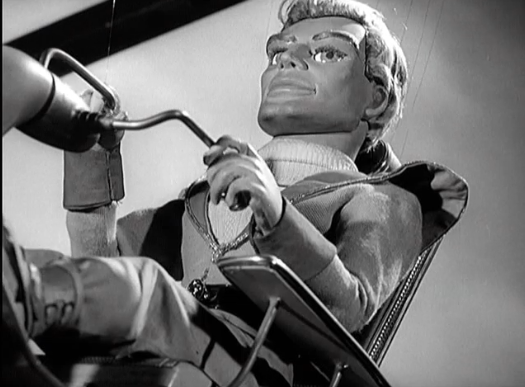 When I write about the introductory montages to the TV programs of Gerry and Sylvia Anderson (live action or Supermarionation), I keep coming back to T and A. Only in this case "T and A" stands for "Technology" and "Action," because those are the hallmarks of these delightful and adventurous series. 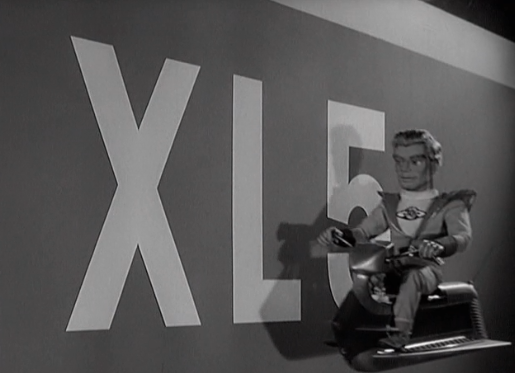 Fireball XL5 (1962) is no exception. 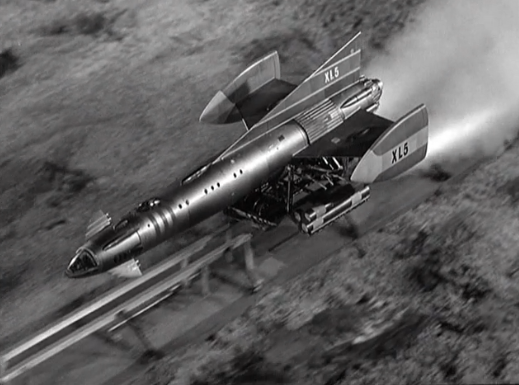 The black-and-white series focuses on the adventures of astronaut Steve Zodiac and his incredible and impressive rocket-ship: the Fireball XL5. The intro commences with an invitation to adventure aboard that very ship. 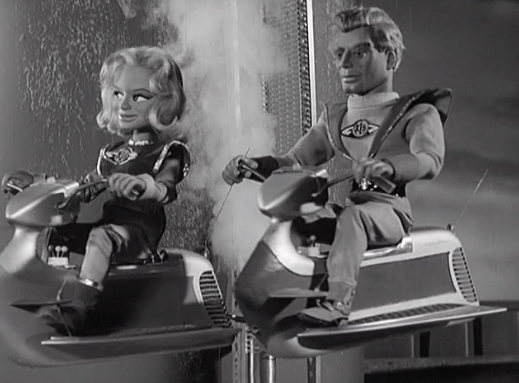 Steve Zodiac (right) asks if Venus (left) is ready to commence the adventure. This is, by the way, an invitation to all of us in the audience as well. Venus affirms her readiness, echoing our own. 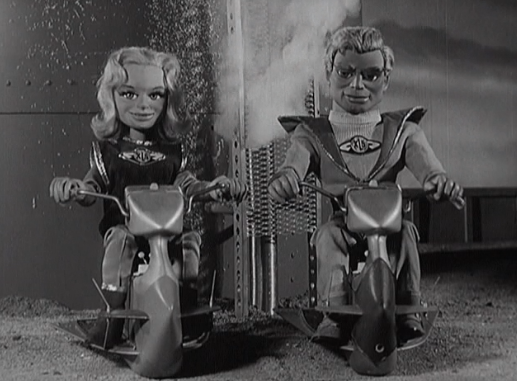 Finally, Steve utters the words "let's go," and then the two adventurers are off on their rocket sleds for a journey to the stars. 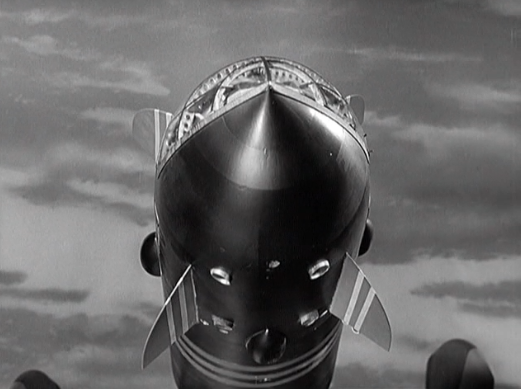 Next up, we get our first real view of the majestic rocket. 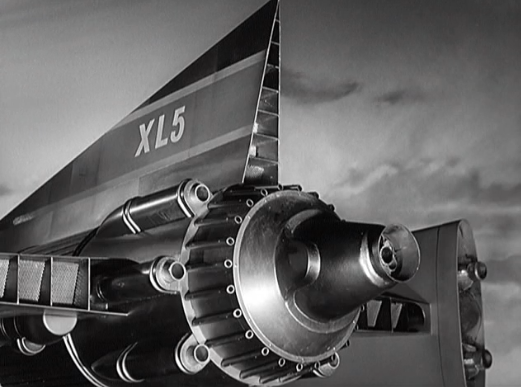 We see the tail fin and serial number of the ship (XL5). as well as its incredible, rear-mounted engine. 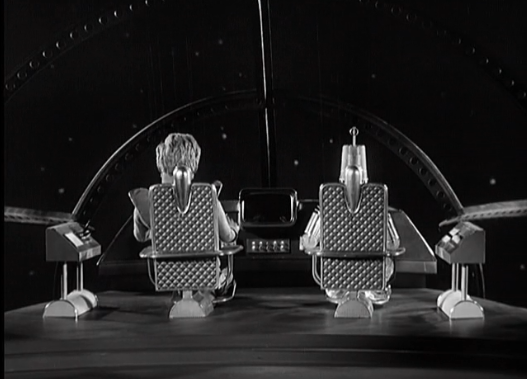 Steve and Venus fly the length of the vessel, so we get a good, long look at this glorious piece of space age technology. 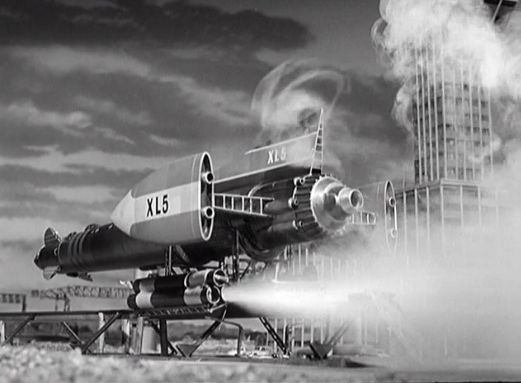 Today, of course, the rocket is sort of "retro-futuristic" in appearance, but back in the sixties, Fireball X-L5 with its pointed fins and cylindrical body represented the promise of the space age: a carriage into the next great frontier. Our heroes board the ship next, and we get a view of the cockpit, from which the ship is controlled. 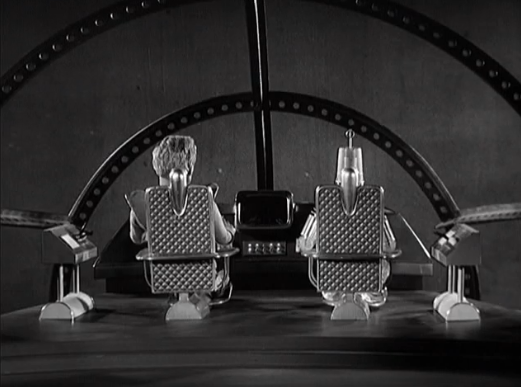 Once more, we get detailed, meticulous views of the incredible technology of Fireball XL5. 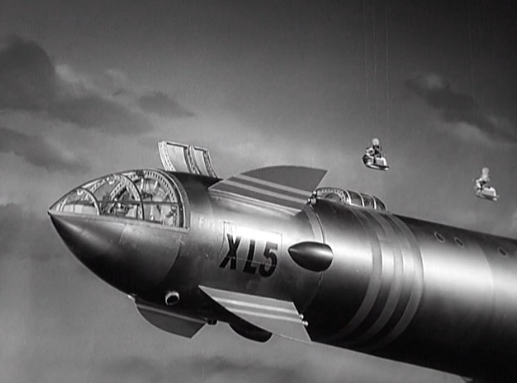 I was talking to a friend recently who noted that these images are phallic in nature, especially when coupled with the series' theme song, which concerns a man who hopes to be an astronaut, who flies his love to space. 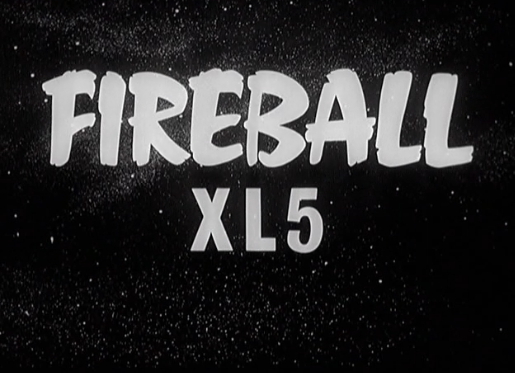 "My love would be a fireball every time I gazed into your eyes..." I told him -- and still feel -- that this is largely coincidence, and therefore a cynical reading of the montage. For me, the images and song are geared towards the young (and innocent) at heart. This is a story about a great adventurer and a great ship. 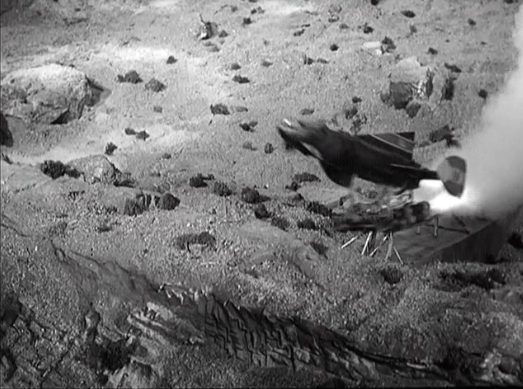 Next, we're off to that adventure, and the introductory montage transitions from the "T" (technology) to the "A" (action). 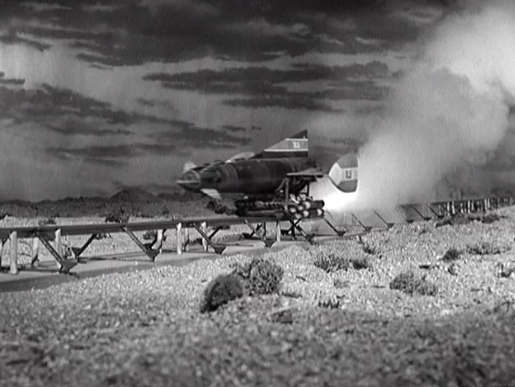 A rocket-propelled mount pushes the ship along a lengthy track, and the Fireball heads to the sky! Once more, look at the loving detail and commitment to that detail. 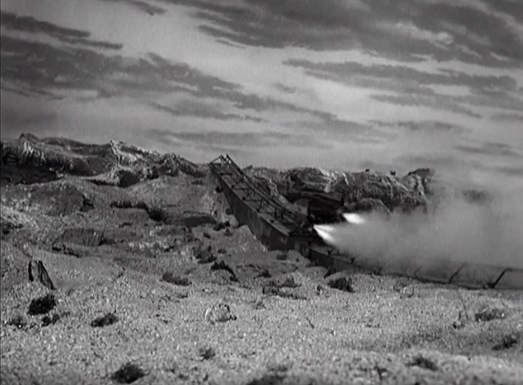 Not just in terms of the ship and its activities, but the miniature landscape that surrounds the launch. 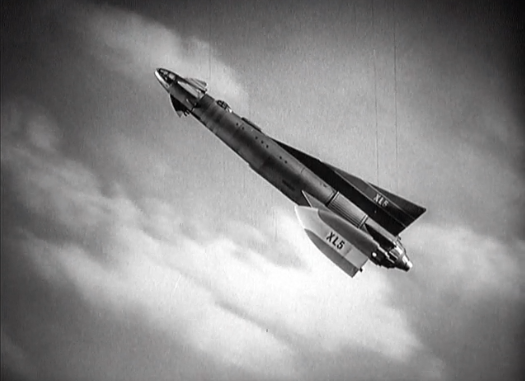 This is a major reason why so many fans love the works of Gerry and Sylvia Anderson, I should add. 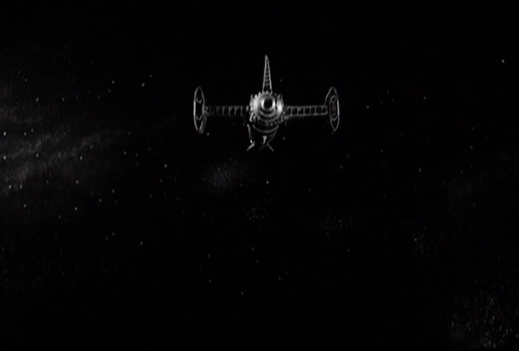 It's not just the technology and the action, but the attention paid to crafting the entire world. In the following images, the Fireball pierces the veil of the sky, and heads off into space. 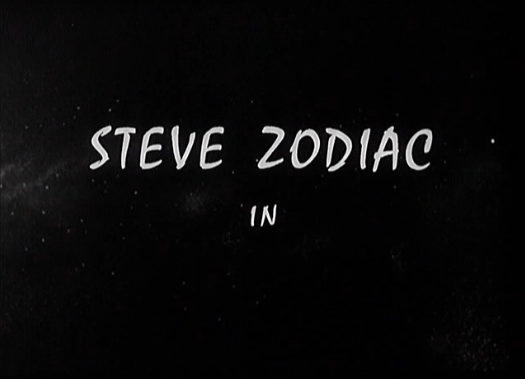 We learn our hero's name (Steve Zodiac) and the stars are our destination! 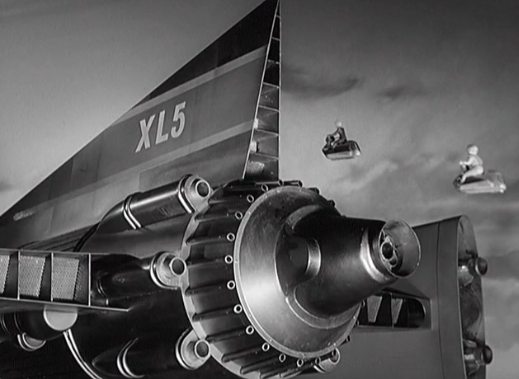 Here's the opening montage and then theme song of Fireball XL5. 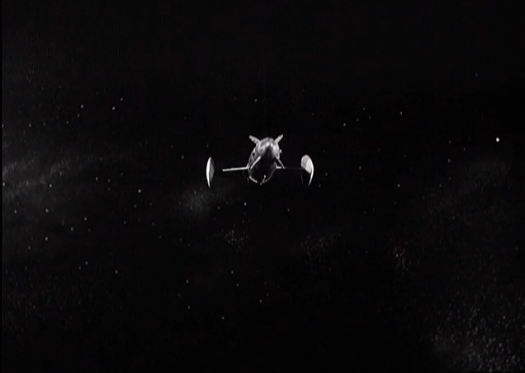 I always thought that moment in the opening where you see the last of the atmosphere thin out and disappear allowing the sky to go pitch black studded with stars as they go into space to be an absolutely wonderful little touch.